Mogadishu (HAN) October 10, 2014. Public diplomacy and Regional Oil and Gas news. The Somaliland Petroleum ministry said that oil firms are signing multiple contracts and negotiating agreements with regional governments which are only, adding fire to Somali conflicts in the Horn of Africa. The European small companies are destabilizing the region and destroying the international community’s effort to build the peace and the security of the country, the Somaliland Petroleum minister told Geeska Afrika Online. Despite those security concerns, the second edition of Somalia Oil & Gas Summit 2014 will be held on 20 October at the Jumeirah Carlton Tower in London. The event is being sponsored by Soma Oil & Gas and organised by the CWC Group for the second time in London, UK. Daud Mohamed Omar, minister of petroleum and mineral resources of Somalia, added that Soma Oil & Gas has been a good partner to the Ministry of Petroleum & Minerals of Somalia over the past year. Soma Oil & Gas had signed a seismic option agreement in August 2013 to assist the government of Somalia in the development of the country’s hydrocarbons sector. the company has successfully completed a 20,500 km 2D seismic survey offshore Somalia and has, to date, reportedly invested approximately US$37mn on the exploration programme. Photo: Somalia is rich in oil and gas and is situated at the strategically important Horn of Africa. 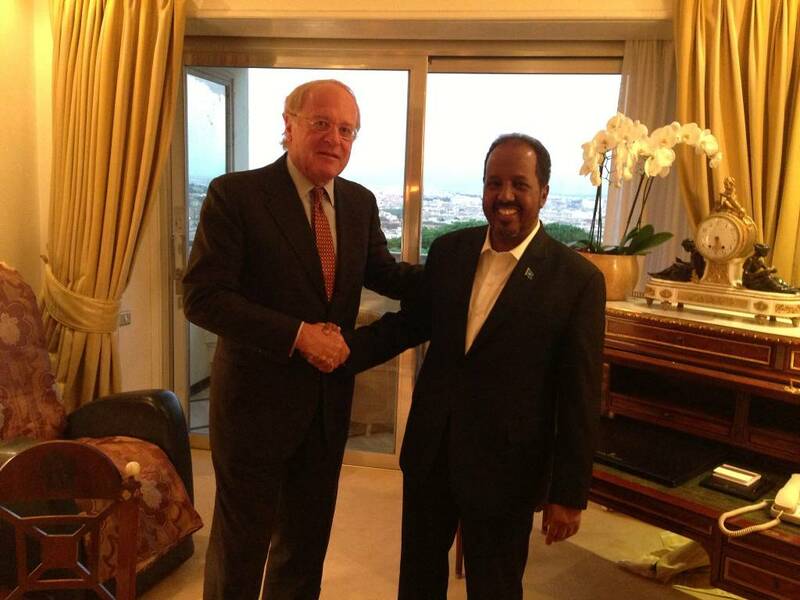 Eni’s CEO, Paolo Scaroni and The President of the Federal Republic of Somalia, Sheikh Hassan Mohamud.